As cool as that title was to write, the video is even cooler. This is one of those articles I post simply because of the purely creative and inventive end result of someones hard work. I doubt the source code will be released any time soon and providing any sort of installation instructions or DIY tutorials is well beyond my skill set. With that being said, a game of chess between a computer AI isn't anything new. However, controlling the chess piece using natural gestures while having your opponent (who just happens to be a robotic arm) do all "heavy lifting" certainly is. 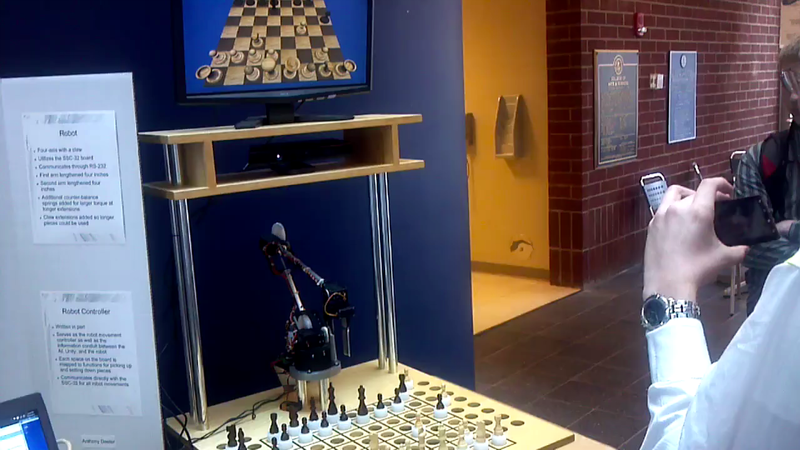 The user is controlling the chess pieces with the Kinect as seen in the screen above. Once a move is completed, the robot will move the piece on the chess board according to your actions and then plays its own move afterwards. I can't help but wonder if the robot is plotting ways to enslave the human race while still thinking at least 3 moves ahead. Love this stuff!